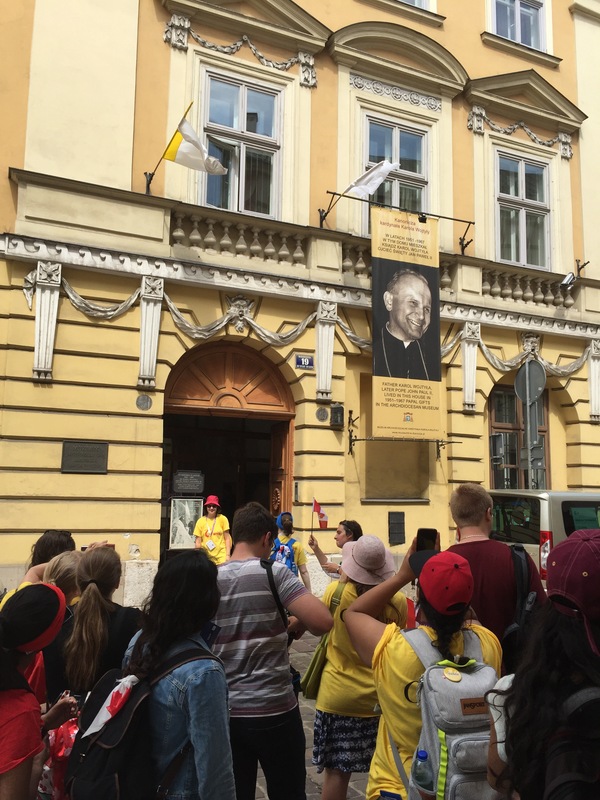 Tuesday July 26 – our first full day in Kraków begins with a hearty Polish breakfast – the pilgrims don’t understand heating the milk for their cereal or having cold meats, cheese, and veggies for breakfast! 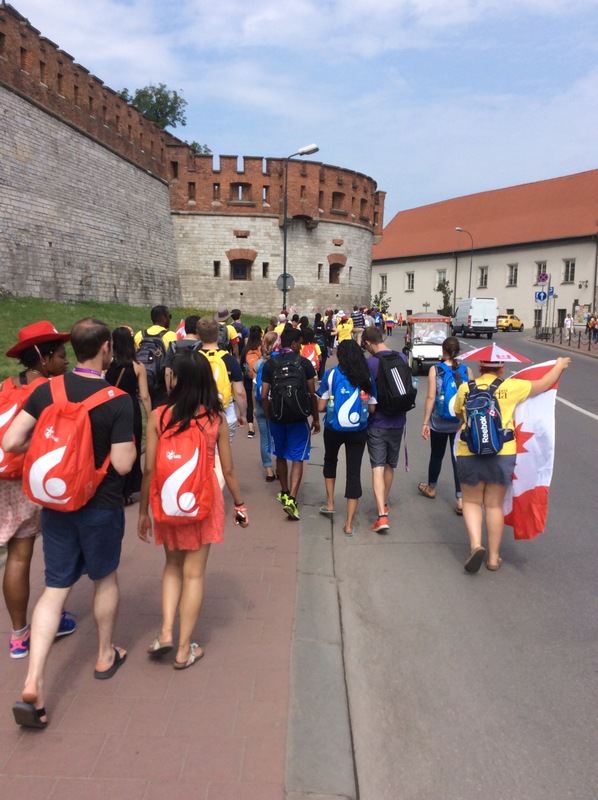 We began by meeting our tour guides at Wavel Castle – the home and burial place of Poland’s Kings. A magnificent structure set high on the hill, it overlooks the old city and beyond. Tomorrow it will be the welcoming site for The Holy Father. No photos were allowed inside the structure – the only place we have found this so far. 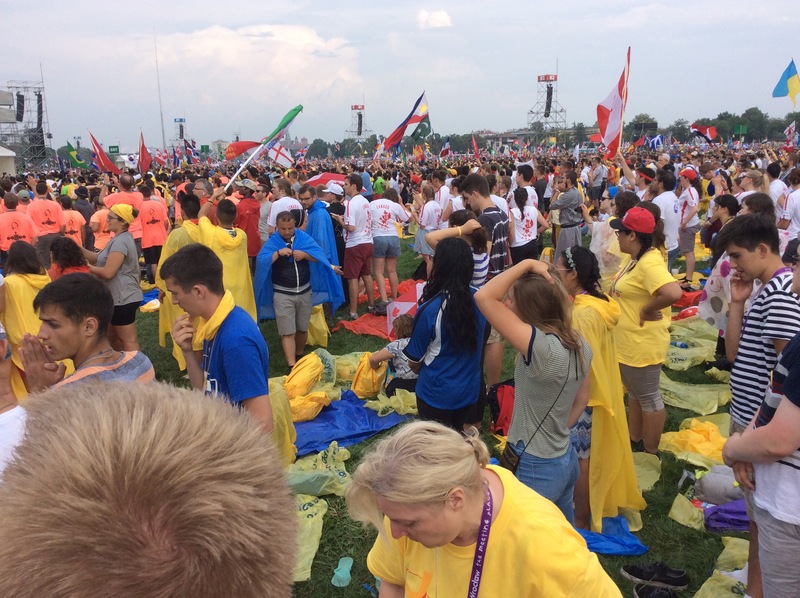 Security was astounding – everyone was scanned, patted down and their bags were checked – you can imagine the amount of time it took to clear everyone. The cathedral, chapels and burial crypts were astonishing works of art. What saved it from destruction during the Second World War was the German Officer stationed there was an art lover and was captivated by the place. From the Castle we walked through the old city past churches, seminaries and universities and places where St. John Paul the II lived and resided before becoming Pope. It is truly an amazing city! A once in a lifetime experience! 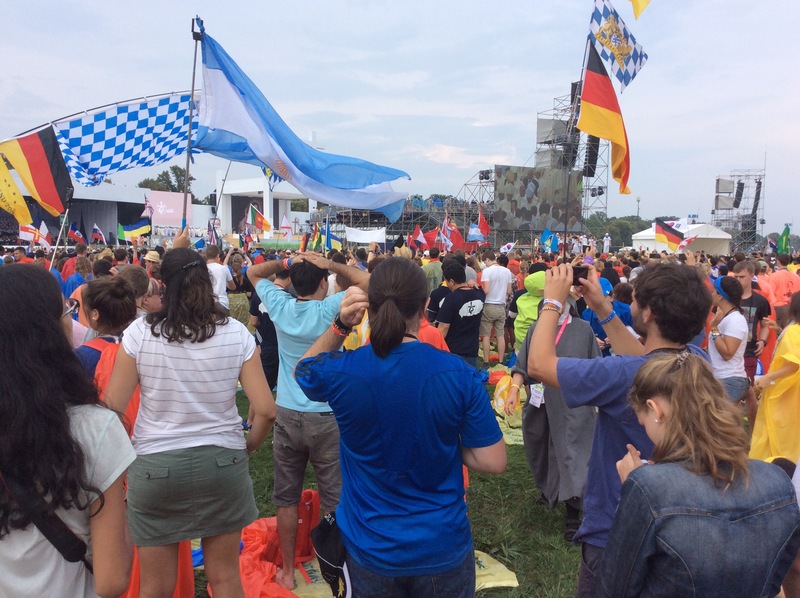 Our tour guide left us at twelve noon and we had three hours to sightsee and eat before heading up to Blonia Park for the Opening Mass of World Youth Day 2016. Blonia park is unique in that it is one of the largest inner-city meadows in Europe with an area of 48 Hecrares. The walk from city centre should take about 15 minutes…..I’m sure that is true in normal circumstance but add into the mix 500,000 pilgrims all desperately trying to get there and you can easily add an extra hour to your time. I must say despite the fact you are in an open field, vulnerable to the elements, the organization and concern for our safety was paramount in the construction of the plans for this event. The military and police presence could not be stronger, more pleasant or more vigilant. They are doing an amazing job! 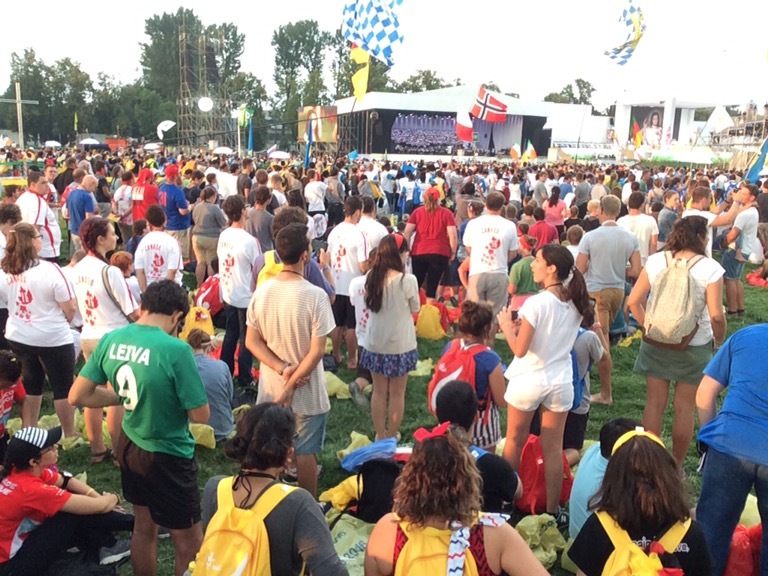 The music was playing, the pilgrims mixing all in anticipation of the celebration of the Masswith the Cardinal. After a moving Mass where everyone sang and prayed in multiple languages we started the long trek back to the Seminary. We sang and danced our way together with new friends from around the world through the streets of Kraków. Children, young and old….cheering on the sidelines and from balcony windows as each nation’s flag passed. 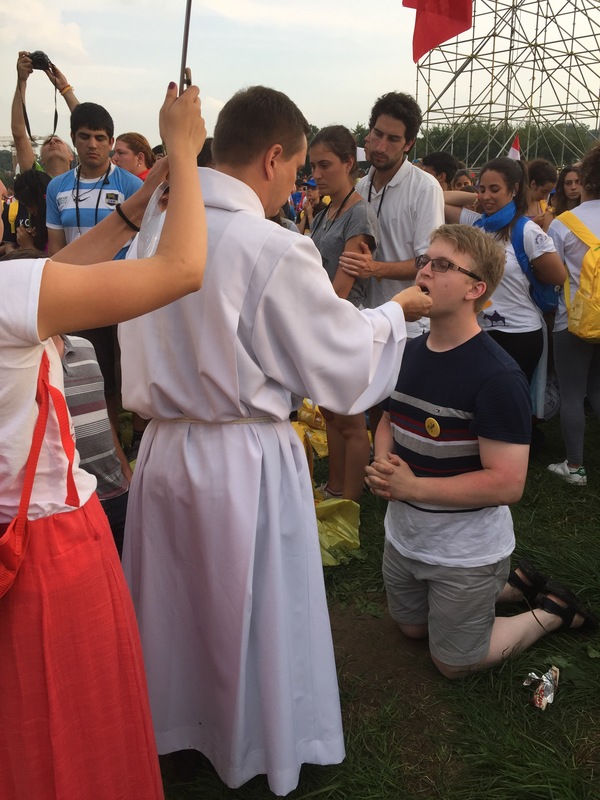 Once back at the seminary we joined with our fellow pilgrims from St Catherine’s for kolatsia – a traditional polish light supper….and then to bed!